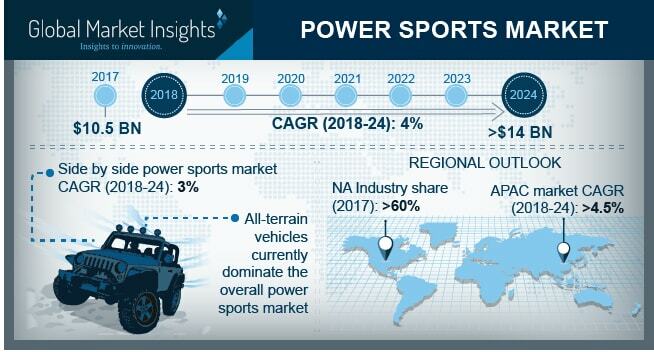 Powersports Market size is estimated to surpass USD 14.5 billion by 2025; according to a new research report by Global Market Insights, Inc.
Increasing off-road leisure activities across the globe will propel powersports market size during the forecast period. Growing youth inclination towards recreational activities including motorcycle riding, trail sports and water sports is enhancing the off-road vehicles demand. Further, improving economic factors, such as per capita GDP and disposable income are escalating the industry size. Rising prominence of off-road races through rugged terrains will propel the powersports market share over the next six years. Escalating demand for exhilarating sporting events involving off-highway vehicles such as quads is positively influencing the industry proliferation. Organizations including All-Terrain Vehicle Association, American Motorcyclist Association and The American Council of Snowmobile Association are promoting multiple events supporting the powersports market growth. Construction of new recreational centers along with maintenance and upgradation of existing sites will positively influence the powersports market share over the study timeframe. Government is actively involved for commissioning new trails to enhance product demand. For instance, in 2016, The Ministry of Culture, Sport, and Parks inaugurated snowmobile and ATV trails in the Moose Mountain Provincial Park. The government of Saskatchewan along with the National Trains Coalition invested over USD 250,000 for this project, playing a significant role in attracting off-roading enthusiasts for recreational activities. Ongoing technological advancements including independent suspension, four-wheel drive systems, EFI, CDI, and turbochargers focusing to enhance the driving experience and reducing driver fatigue will propel the powersports market size over the study timeframe. Further, introduction of hybrid powertrain to address noise and emission issue will positively influence the industry share. Off-road driving without appropriate safety gears will lead to fatalities and injuries in case of accidents, vehicle collision or roll over. Lack of proper training coupled with ignorance of safety precaution play a key role in the increased number of accidents. In 2015, CPSC reported of over 14,000 ATV-related fatalities of which 22% were below 16 years of age. Increasing illegal and unmanaged usage of vehicles will hamper the vehicle adoption from 2019 to 2025. Government organizations including All-Terrain Vehicle Industry European Association (ATVEA) and ATV Safety Institute are taking initiatives for responsible usage of off-road vehicles and reduce injuries and fatalities arising from accidents. Active government initiatives will provide positive outlook to powersports market in the long term. All terrain vehicles lead the powersports market size with its adaption for recreational, sports, and leisure activities. Compact footprint, easier maneuverability and ability to travel through multiple terrains will ensure its dominance over the study timeframe. Further, low maintenance costs, and reduced vehicle weight compared to other vehicles will strengthen the product demand. Heavyweight motorcycles will witness strong growth owing to increasing motocross events across the globe. High power and torque generation coupled with smaller size enhances the power to weight distribution and cornering abilities. Moreover, easier towing and parking capabilities will support the segment growth till 2025. Side by Side vehicles holds substantial share in powersports market size owing to superior safety features. The vehicle offers similar driving characteristics as conventional vehicles with enhanced roll-over protection and multiple seating configurations. Rising UTV racing and off-roading events including Grand National Cross-Country Series, Pro UTV Racing, UTV World Championship, and Lucas Oil Off-Roading Racing Series will positively influence the industry proliferation. North America powersports market share will witness over 3% CAGR owing to presence of multiple recreational facilities attracting the participants. According to the U.S. Recreation Government, the country consists of around 150,000 miles of trails, 57, 000 miles of streams, over 120 alpine ski areas and 439 wilderness areas providing ample space for the leisure activities. Active government support for establishing recreational facilities is positively influencing powersports market size. Countries in Latin America and Middle East & Africa are taking initiatives to enhance off-road leisure activities. For instance, in April 2018, Saudi government laid the foundation of recreation and sports facility near Riyadh to attract more participants thereby enhancing the industry growth. Prominent players in powersports market includes BRP, Polaris Industries, Honda, Suzuki Motors, and Harley Davidson. Industry participants are upgrading the product portfolio to attract consumers. In June 2018, BRP announced Can-Am branded 2019 portfolio of UTVs and ATVs with advanced features including Rotax V-Twin engines, intelligent throttle control system, selectable riding modes, and fully lockable on the fly front differential system.